History was made as Central Florida successfully met the challenge to #FilltheBowl for the Orlando City Lions’ inaugural game as the newest Major League Soccer (MLS) franchise. More than 62,500 soccer fans dressed in purple cheered at the renovated Citrus Bowl stadium as the Lions faced the New York City Football Club. The sold-out game was a 1-1 draw with Orlando superstar Ricardo Kaká scoring the lone goal for the Lions. Orange County Mayor Teresa Jacobs was on the field for the official opening ceremonies prior to the 5 p.m. game, which was televised in more than 100 countries and ESPN2. Other dignitaries on the field included member of Orange County’s Board of County Commissioners, Orlando Mayor Buddy Dyer, MLS Commissioner Don Garber, Orlando City Soccer owner Flávio Augusto da Silva and Orlando City Soccer President Phil Rawlins. The campaign #FilltheBowl launched last month and was a major success, with the last tickets selling a week before the game. With high demand, additional standing room only tickets were added in the days leading up to the game. Fan attendance is the largest ever recorded for a soccer game at the Citrus Bowl, surpassing previous crowds during the 1994 FIFA World Cup. The game drew the second highest attendance numbers during an inaugural MLS match. 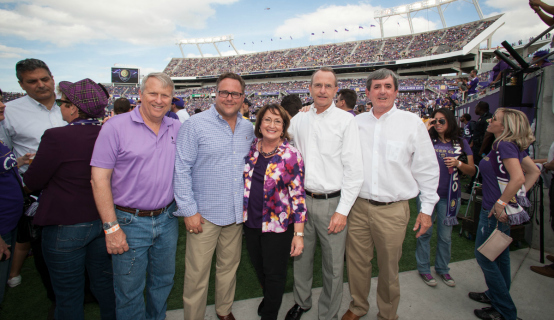 In October 2014, Mayor Jacobs joined the community in celebrating the historic groundbreaking of Orlando City Soccer’s new stadium in downtown Orlando, which was followed by a construction start in November. The “March to the Match” celebration, on October 16, marked a monumental milestone in the continued transformation of Orange County into a mecca of economic, cultural and sports opportunities, which are essential to supporting the region’s increasingly diverse and creative population. The stadium is part of Orange County’s approved use of tourism tax dollars for a $94.5 million venues package, marking the transformational era of sports, creativity and arts-driven economic development and innovation for the region. The Orlando City Lions will play in their new stadium beginning in the 2016 season. The new stadium is considered one of the best facilities for sports in the country. With capacity for 19,500, the stadium will include a full-roof canopy built to enhance crowd noise, a natural grass playing surface, a sunken field and a scoreboard balcony bar. Along with the new MLS soccer stadium, local citizens will enjoy 19 new, multi-use athletic fields, perfect for soccer throughout Orange County. Orange County’s approval of a new, multi-use, soccer-centric stadium played a key role in the creation of the new MLS team. Global soccer icon and team captain Ricardo Kaká joined the Orlando City Soccer Club in 2014, boosting the club’s transformation into the 21st franchise of the MLS. The week leading up to Sunday’s game was filled with events organized by Orlando City Soccer Club, including a benefit for the Orlando City Foundation, a Purple Pride 5K Run, an Orlando City Pub Crawl, and Soccer Under the Stars, a free night of movie, popcorn and games at the Lake Eola amphitheater. The Lions will play the remaining 2015 season at the renovated Citrus Bowl. A collection of photos from the MLS game are available for use by the media and are located on Flickr.